Sandra Thielman, who is spearheading the project to restore the Beecher mausoleum (initiated by Arthur Struve and Henry Thielman), is planning a dinner at the Amvets’ for May 17th (6:30 p.m.). Henry Thielman was a real estate speculator and vice president of the German American Land Company, with offices at 84-86 Washington Street, Chicago and at Stuttgart, Arkansas, where he was one of a consortium who sold “rice lands”. 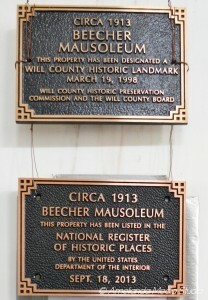 In 1899 Thielman moved to Beecher. The sale of rice land in Arkansas was heavily promoted in Beecher during the early years of this century. There were advertisements in the Beecher Herald every week, and the Local and Personal column kept townsfolk abreast of the comings and goings of people who invested in these properties. Henry Thielman ran half-page ads with large, black letters reading, “Rice King of Cereals, Arkansas State of Golden Dollars.” At the same time lands in the Dakotas and Florida also were being advertised constantly, and a number of Beecher people moved to Minnesota (Boltman, Oberheide). On November 1, 1908, a corporation was formed for the purpose of raising rice in Arkansas. Articles of incorporation were drawn up by E. P. Harney, a Momence attorney, and the incorporators were: William Rump, president; Thomas Clark, vice president; Herman G. Hinze, secretary; Louis Stade, treasurer; and Henry Haase, H. F. Haase, Chris Bockelman, William Wehmhoefer, and Henry Wehmhoefer, and Henry Thielman. A half section of land was purchased and named Cedar Grove Farm. Herman Hinze was to manage it. He went to Arkansas to buy mules and to prepare the farm for his family, who were to follow him later. As the story is told these days, the venture was not a roaring success, and many Beecher people, including Henry Thielman, who seems to have instigated the venture, lost, as they say, a bundle. A primary election was held in Beecher on March 9, 1909. Nearly every eligible voter in the village voted. Henry Thielman ran for village president against Henry Ruge. Ruge won by 45 votes. (Ruge: 82, Thielman: 37). Aside from this venture into village politics, Thielman does not seem to have made any runs for public office, but he was vociferous in his arguments for civic improvements. Thielman was interested in the problem of roads in the Beecher area. He wrote a long article for the Herald, published January 28, 1910, that ended with the following words. I have quoted them before, but for anyone who may not have read them, here they are again. They are worth repeating. “This is not my own idea, but while out in Ohio I met a hard roads commissioner who gave me this information. There the hard roads problem is practically finished, for they have built them for twenty years. “… There are four classes of people to contend with. The first is the bright, progressive and successful farmer. He is in favor of hard roads and all modern improvements…but sorry to say is sadly in the minority. Second is an equally bright and successful farmer, but who is so selfish and stingy that he will fight any improvement if it costs money…Third, comes also a good and successful farmer, but he says neither yes nor no; he is a hypocrite; he thinks it is very smart to be noncommitant; he is so imbued with his hypocritical ideas that he embodies them in his prayers; you can find him in any church; he has not adopted the brotherly idea to do the most good for the most people; he has a motto of his own; it is to fool the most people the most times and let them think he is good; he is like our illustrious Lincoln, but different. The fourth class is just a plain, common, everyday fool; he is not entirely harmless, for he has a vote, and it is more apt to be used against a good cause than for it. “Now, having succeeded in getting most of you hopping mad, I lay before you a few plain facts, with wit: It is a known truth that you can’t keep your boys on the farm nor can you get hired men. The reason is obvious in itself. Four months in each year the roads are impassable; the boys and girls have to stay at home; they can’t mingle with their associates or come to town; they are sick of these conditions. During this time you, Mr. Farmer, sit in the kitchen and toast your feet in the stove oven. You send the hired man out on the road; he is tired of the condition also, so are you. All work and no play make Jack a dull boy all day. Solution – get good roads. “Now, your objection to this is party the expense. Let me tell you something. The expense is nothing compared to the benefits… you do not have to pay for it yourself, nor at once. The expense can be divided over twenty years, so while you are getting the benefits now, some of it will have to be paid by a future generation. “Here is another fact. The state is holding thousands of tons of crushed rock for you, which will cost you nothing, yet the state is begging you to get this stone to make hard roads. The railroads are begging you to make hard roads and offer to transport the stone at actual cost – that is, just the cost of moving the cars; they are begging you to make hard roads for the mud roads are very costly for them for the reason that the hauling of freight is so unevenly divided on account of bad roads that they must have twice the number of cars in service which at other times stand idle. “Furthermore, there is a law that these roads can be built under the state aid. The state also sends engineers to supervise the constructions of same, so as to make they are made proper. “Now, Mr. Farmer, the cost of the building roads, as tabulated from different states, runs from $1,200 to $3,000 for six miles. Taking the highest figure to get a serviceable system of hard roads for Beecher it would cost you about $.50 per acre each year, but we will make it $1, for twenty years. This is doubly overcome each year by the difference in hauling your crops when you are ready, giving you the rest of your time to devote to your farms. But on the whole the land would go up more than the cost of the roads. It has done so in every state and will do so here. “Now, here are a few benefits derived from stone roads at once, as soon as they are made. First, it shortens the distance to town, for it will enable you to reach town in less time. “Second, it will induce you to get automobiles, and that way, give your poor horses a rest, while at the same time you can out enjoying yourself, and also get to see your neighbors. It will also be a large factor in keeping the boys on the farm. This is a mechanical age, and even your boys on the farm know this; they crave the pleasure of taking care of a machine. Give them one and see the difference it will make. In 1910 the village board was faced with the problem of what to do about the improvement of waterworks in Beecher. The board set about studying the various systems and costs, visiting neighboring towns to find out what they could. On May 13th four carloads of board members and citizens went to Monee and Manhattan to inspect their waterworks. The Beecher Herald reported that the automobiles were owned by Arthur Struve, Henry Thielman, Henry Hack, and Fred Deneke and his son-in-law, R. H. Wegert. In 1912 Henry Thielman and Arthur Struve staged an elaborate campaign of newspaper articles to sell spaces in a proposed mausoleum to be built by the New Light company. In its prepared literature the company stressed the superiority of above-ground burial. Fire and storms would not be a danger. It was argued that a mausoleum of the type proposed required “no upkeep” and that no weeds would grow over a grave, not in a thousand years – but $5 per crypt was set aside for maintenance of the building. This money was to be under the control of the owners of the crypts, which were to cost $200. The builder agreed to start work on the condition that 100 crypts would be sold. A committee went to Crown Point to inspect a mausoleum there. The Beecher mausoleum is a reinforced cement building with a Bedford stone exterior and marble inside. The 210 crypts were to be formed by July 25, 1913 and the rough work finished by August 15th. By Christmastime the mausoleum was almost completed. An article in the Herald included a request for items to be placed in a time capsule, no date given for the opening. To be placed inside: (1) copies of the Eastern Will Union published in 1879, (2) copies of the Beecher Herald, (3) a history of Beecher, (4) a history of Washington township. Washington Township Museum, a project of Beecher Community Historical Society, is located at 673 Penfield and is open on Saturdays from 9 until 11 a.m. It is open at other times by appointment. There is no admission fee.